Providing the best free and premium hosting services. Both our free and premium hosting includes a great site builder. Armed up with 100's of website templates, creating your own site with us is so easy, WHSISYG (what you see is what you get) editor allows easy editing and previewing of pages as you go. Premium hosting customers can enjoy the amazing Softaculous script installer, which has over 256 scripts that can be installed in just a single click of the mouse! Scripts are categorized by into groups such as Forums. Photo Galleries, CMS, Chat scripts and Ecommerce chat scripts. 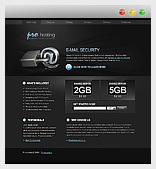 Free hosting also includes a more basic script installer which includes 30 popular scripts.